17a. [*Breakfast, in Burgundy], LE PETIT DEJEUNER. Does any other language call breakfast “the little lunch”? 23a. [*With 52-Across, 1787 Mozart composition], EINE KLEINE / 52a. [See 23-Across], NACHTMUSIK. 40a. [*Repeated lyric in “La Bamba”], UNA POCA DE GRACIA. I don’t know the lyrics. This means “a little bit of grace.” Filled it in via the crossings. One inconsistency here is that petit and kleine are both adjectives meaning “small,” whereas una poca is a noun meaning “a little bit.” There aren’t any familiar-to-Anglos Spanish phrases that start with pequeño, though. LINE DANCE and ORANGINA are my favorite fill here, along with KAGAN subbing for her more-common-in-crosswords first name, Elena. And LILAC, always pretty (if a bit cloyingly fragranced). 16a. [Figurine on many a wedding cake], BRIDE. I like the clue. Some wedding cakes do have two grooms. 22a. [One throwing shade? ], ELM. Eh. You can be cute with contemporary/black slang like “throwing shade,” but just to drop an ELM tree on us? 36d. [Assail], SET AT. I don’t know which I’m more tired of seeing in grids, SET AT or RAN AT. Let’s call it a tie. 3.75 stars from me. I don’t love all the fill, but I whizzed through the puzzle so the cluing must’ve been pretty smooth overall. All right. Who ticked off David Alfred Bywaters? Because he’s giving us the SILENT treatment today. 1a [*Countries just for me?] I LANDS. Islands. Yecch. As far as groaners go, that’s gotta be the groaniest. Fortunately, they get better. 16a [*School loading zone?] PLACE OF BUS-NESS. Place of business. Well, they will get better. After this one. 29a [*Rich couple?] TWO HAVES. Two halves. An improvement, although “two halves” doesn’t strike me as a very strong base phrase. Feels like a partial. Contrast this entry with 24d THE POOR. 35a [*Means of prison communication?] DUCT TAP. Duct tape. Okay. That works. 44a [*Thoroughgoing beaver’s command?] “DAM IT ALL.” “Damn it all.” Nice. Funny, even. 58a [*Listening to a Baroque fugue, maybe?] BACH PROCESSING. Batch processing. And a fun play on words here. The base phrase takes me back to my college days sitting idle in a computer lab while the sysops tie up all the available resources with their batch processes. Grrr! And you’re your revealer: 65a [Like the letters omitted from the starred answers (collected here)] SILENT. Got it? 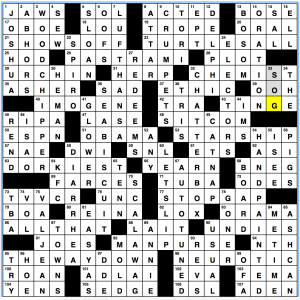 Each base phrase has a SILENT letter which is then removed in the grid thus causing clue-based wackiness. I wasn’t too keen on the first two entries, but the rest of it worked well enough to compensate. I feel like I’ve seen a similar theme not that long ago and probably in the NYT. A cursory look on my part didn’t produce it. Anyone? Rather unusual grid formation with theme entries in both NW and SE corners and 14-letter entries in the 3rd and 13th rows thus requiring strips of blocks in the NE/SW corners. As a result, the average word length for Across entries (minus theme answers) is higher than normal with plenty of 6s and 7s (I like SEAWEED and SCARAB best). Nothing too flashy in the Down department, but we get HOT DATE, NECKTIE, and SPOT ON. And despite the unusual grid and the amount of theme material causing constraints, most of the fill felt lively and interesting. 12d [Composer Holst]. GUSTAV. This got me thinking about The Planets and this headline. You’re welcome. 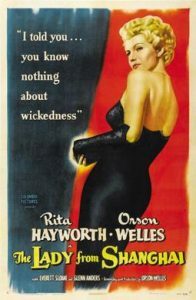 42d [Rita’s “The Lady From Shanghai” co-star]. ORSON. For some reason I was thinking Rita Moreno, but it’s Rita Hayworth who co-starred with estranged husband ORSON Welles. 7a [Make a long story short, e.g.]. ABRIDGE. Is “e.g.” the correct qualifier here? I think I would go with “say” or “maybe.” As these are verbs, I don’t think you can use “e.g.” Pedants, what say you? It’s Wednesday! There’s an AVCX! Let’s do this thing. This week’s puzzle is a 19×19 by Aimee Lucido. The editor rated this one as a 2.5/5 in difficulty, but I found it a little tricky to get a foothold on. That may have just been the carbs from my employer’s monthly Waffle Wednesday coursing through my system, though. 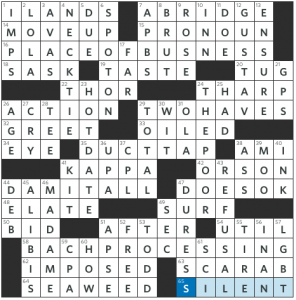 Well, each of those definitely has a turtle in the clue (which I didn’t realize until putting this writeup together), and you get some nice loops that add up to the clued answers: CHIPPER SEA, BISCUIT CHATTER, BOX HAND, and PAINTED WOOD, in order. This wasn’t the most obvious theme, but once I sat down to look at it in depth, I really appreciated it. Keeping things brief since I’m ducking into meetings, but I liked this one even if it was a little tough getting started! My favourite part was getting two Jabberwocky clues (and not one a nonce word!). THROWON referencing I think Paul Hogan is a meme not based to any degree in Australian reality, but from a bizarre advert. For starters, shrimps aren’t typical Australian vocabulary. You’re more likely to get a yabby. This entry was posted in Daily Puzzles and tagged Adam T. Cobb, Aimee Lucido, Daniel Mauer, David Alfred Bywaters. Bookmark the permalink. e.g. means “for example” and allows for more than one example; i.e. means “that is” and thus is narrower, more specific. It doesn’t matter if you are talking about verbs or nouns or adjectives. The French and German answers were familiar to me, but not the Spanish one. What is UN APOCADE, I thought to myself. But the crosses were straightforward so no problemo, as they say. And I learned something. I apologize if the lesson is a little longish, but clear, I hope. It definitely was inspired by the book! And like Amy said, I’m a writer so it worked out really well! Also I have a hilarious story about this but I’m waiting to hear if I can tell it publicly or not. okay so the story here is that literally the DAY that I sent this puzzle in to Ben, we got an email from John Green’s social media manager asking if we can make a custom TURTLES puzzle. It was a hilarious coincidence, and also a great one because now the puzzle will be one of their marketing materials for book launch! NYT: I really liked it, but I thank Zulema for the needed language lesson. I failed on the La Bamba lyric, and did not know the crossing KROC. I loved that the NYT this week is playing with some generally unpopular themes, such as foreign words, today, and Roman numerals, yesterday. 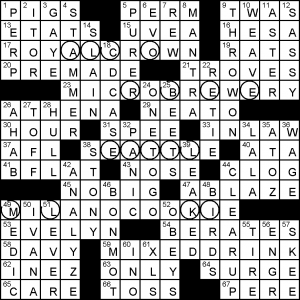 Furthermore, when the theme is foreign languages, there is usually an attempt to leave other foreign words out of the non-theme answers, but today’s puzzle reveled in them, for example, ECLAT, DES Plaines, BRIO and CRU (even though those are all English words, they have a borrowed feeling). There are also four foreign proper nouns, MEIR, KANT, MEHTA and OPEL. I know that many dislike this kind of clue and theme, but I’m grateful to have these once in a while. (But please, give up EENIE. Many find that one offensive, and I think it’s worse than some other bugaboos.) After today’s fun, I’m ready for a theme tomorrow of Hollywood character actors of 80 years ago or so (hooray, Sam Levene!). But as Monday’s puzzle had a Hollywood theme, I guess that’s out. That’s a mighty impressive NYT time. Thanks for pointing out my typo. Next time, see if you can do it without the snark. I didn’t think that was snark. Maybe it was a Boojum. Whoa, shocked to see HERP as in “herp derp” appear in the AVCX. That phrase has long been banned from the school where I teach and plenty of other places as it’s meant to be imitative of a mentally disabled person. 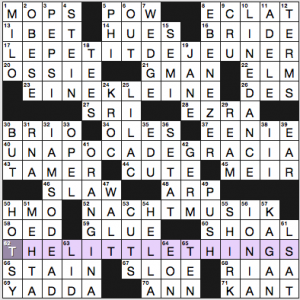 I mean, the common crossword entry DUH is already kind of pushing it in that regard, but it’s become so widespread there’s no point in fighting that battle. But I’d prefer to see “herp derp” stay the hell away from the crossword. I find it hard to believe that HERP couldn’t have been edited out. In any event, too arcane for a daily crossword. To clarify: this is a slangy, shortened form of herpetology. Hey, thanks for this feedback. I had always heard of herp derp as like a “dum dee dum” fill in, completely different from “duh”. But I appreciate your pointing this out to me and I’ll look into the history a bit more before including it again.